Travel guitars are smaller, lighter and generally more portable. Most are quite easy to carry. During times of little travel, you can keep the extra guitar in a second location where you often wish to have access to a guitar. A decent travel guitar can probably get you through most performances. If you want a fancy instrument, a fine parlor guitar in a nicely-fitted softshell case would work quite well. For something more affordable, consider a guitar like the Taylor GS Mini (Mahogany)[? ]Affiliate Link. Don’t travel with a dried-out guitar. A guitar that has gotten dried out is much more fragile than a properly humidified one. This process starts weeks before you travel; it can easily take 2-3 weeks to bring a dry guitar back to the appropriate level of humidification. So don’t expect that you can stick a humidifier in your guitar and suddenly be ready to board a plane. A dried out guitar is highly likely to start off the journey in good shape and show up at the destination with giant cracks all over. A properly fitted case will protect the guitar better than a loose fit. The instrument should fit snugly in the case with no wiggle room. If your guitar case is too big, you can fill fill up some space with a few pairs of socks. You especially want to pack the guitar properly around the headstock and neck. Recommended: Mono M80 Gig Bag[? ]Affiliate Link. Although many advise strictly using hardshell cases, there’s a case to be made (no pun intended) for the soft gig bag. A high-quality padded gig bag can be better than a hardshell case. It can actually offer more protection in some cases, and it makes the guitar small and light enough to carry more effectively—reducing the chance that it’ll get knocked around. This also improves the chances that you can carry the instrument on an airplane. A guitar in a gig bag is much smaller, lighter, and easier to stow. And airliner staff will be more sympathetic with your need to bring the instrument aboard. Travel by Car: Never Leave it In the Trunk! If you’ll be traveling by car, don’t leave the instrument in the trunk of a parked car. Not only could it get stolen, but it could be exposed to extreme heat or cold that can severely damage the guitar. All travelers have needs, from medical and personal needs, scheduling requirements, luggage and more. And traveling is a serious business where safety is on the line. Be courteous to any employee you interact with, and understand that they’re expected to attend to many needs besides your own. Don’t check your instrument at baggage check upon flight check-in. Even if asked, you can politely explain that if it’s necessary to check it, you'd like to check it at the gate. Say the instrument is fragile and you'd like to bring it on the journey as far as possible. This increases the chances you’ll get it on the plane. Getting your instrument stowed properly is a much easier task if you can find a way to board early. Sometimes that just means showing up early, but in the case of a flight you would need find a way to board early to have the best chances of carrying on. Most planes board rear-to-front, so a rear seat will often board early. Airline employees are responsible for quickly loading hundreds of heavy suitcases into the cargo hold, and they generally expect that you haven’t filled them with fragiles. While some may recognize that a guitar should be treated differently than a bag full of clothes, you do not want other people handling your instrument. Normally you will be allowed to carry-on. Larger jets have ample space that can accommodate an instrument in a hardshell case. Even smaller commuter planes normally have a large closet in the front. 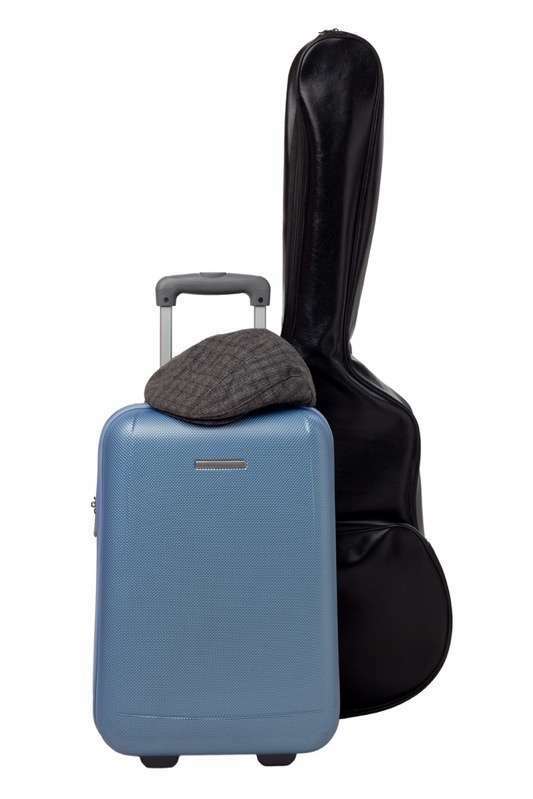 Staff that interact with passengers generally understand that a guitar should be carried on, and will try to find room for it. If an employee tells you that your instrument needs to be checked, you need to think fast. Tell them you called ahead and got assurance it could be carried on. Tell them it is extremely fragile and the company will be liable for damages if it breaks. Be extremely courteous and patient and do not make a scene. Flying on a plane is serious business and there are more important things in the world than your guitar. Politeness can get you a long way. Being uncooperative can get you kicked off the plane. In 2012, Congress mandated that US airlines allow passengers to carry-on their musical instruments free of charge. See the full bill here. There are stipulations and exceptions, but essentially the airliner must accommodate the instrument if there is room for it in the overhead—so board the plane early, and if necessary be prepared to quote this law. Remember that it’s important to be patient and courteous to both ground staff and flight attendants.